1 of 3 In a medium bowl, mix together broth, soy sauce, vinegar, cornstarch, sugar and Sriracha sauce. Set aside. 2 of 3 Heat oil in a large nonstick skillet or wok over medium-high heat. Add chicken and stir-fry for 6 to 7 minutes, until no longer pink inside. Remove to a plate and keep warm. 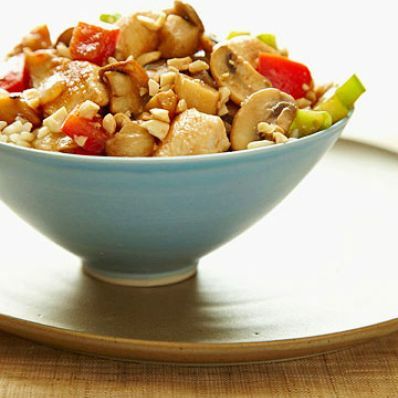 Add mushrooms, red pepper, onion and celery to skillet and stir-fry for 6 minutes until vegetables are crisp-tender. Stir in reserved broth and soy sauce mixture, water chestnuts and cooked chicken. Simmer for 2 minutes, stirring occasionally, until thickened and water chestnuts and chicken are heated through. 3 of 3 Sprinkle with chopped peanuts and serve with cooked white rice.